Because the initial showing sold out E Street switched the show to Theatre 4, their largest, and it was almost full by showtime. Despite the topic, the US corn industry had a good night as people were shoveling the stuff into themselves while sipping on the finest high fructose from the plains. After about 15 minutes, however, the munching stopped and the theatre was silent. The film frames its subject as that which ‘is hiding in plain sight.’ It is organized around Scahill’s work as an investigative journalist for The Nation on national security affairs. His presence unites the disparate parts but he’s no adrenaline junkie. He’s shown working, writing in his notebook, listening, and also being afraid, brooding, tying in his computer, being intense, overwhelmed and burdened by it all. He described himself as ‘gutted’ on All In on Thursday and this comes across to a degree (the classic in/out of war zone disjuncture is depicted as we see him in his neighborhood in Brooklyn). Despite his shades and black garb, there is no showboating masculinity by Scahill in the film (which was refreshing). He appears as earnest and intense, and disturbed by what he’s encountering. It begins with Afghanistan and Scahill tracking down a night raid that seemingly went awry. He ventures on the dangerous journey beyond Kabul and meets the family of the victims who relate their story. Through some chance video and photographs (and how omnipresent visual recording devices are changing what we know and believe is a theme of the film) he is able to tie the raid back to JSOC (he interviews another reporter who broke the story first, a somewhat unusual move in what must be a highly competitive profession). He then provides some background on this group — essentially a presidential paramilitary unit — and there are scenes of Washington DC (66, Tysons Corner, etc) before he focuses on his core subject which is the US terrorist assassination program, in bureaucratize ‘High Value Targeting’. He makes his first trip to Yemen to chase down a report on a drone strike in southern Yemen that murdered many poor tribesmen. We see the familiar marking on the drone (General Dynamics, Rosemount) and meet the Yemeni journalist Abdulelah Haider Shaye who was imprisoned for writing about it. The film suggests that Obama personally requested that Ali Abdullah Saleh keep him in prison (he’s apparently STILL in prison in Yemen, according to Scahill). The failed Christmas day bombing leads to the emergence of Anwar Al Awlaki, an American citizen, as a new terrorist mastermind that is, in effect, on the ‘kill list.’ He tries to find him in Yemen and fails but does manage to talk to his father. Its a fascinating story, one told in Chapter 2 of the book. 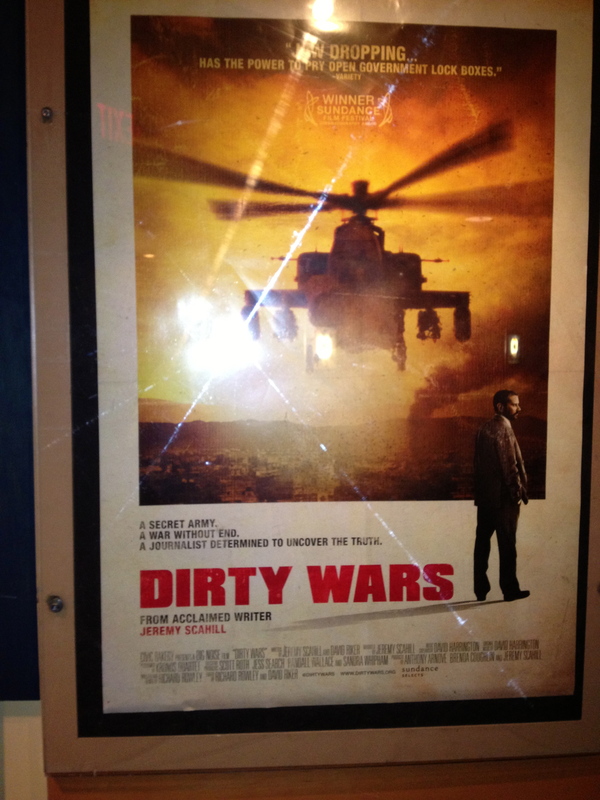 Thereafter the film moves back to Washington, the killing of OBL, and Scahill’s trip to Somalia. This receives scant coverage (he indicated they had a 4 four version of the film before Sundance which provided all the background and further details) but enough to convey the message that the US is allied to some unsavory warlords in Mogadishu like Yusuf Mohammed Siad (Indha Adde). He then learns of the drone strikes that kill Al Awlaki and then, stunningly, his 16 year old son. This leads to a return to Yemen and a heartbreaking tale of loss from a grandfather and grandmother. Throughout the film the faces of children feature prominently. Its difficult, especially if you’ve young girls like I have, to watch sometimes. Pregnant women getting murdered are also cited at the outset and again on another occasion. This was, as Scahill stated afterwards, a conscious choice of the filmmakers, to put ‘a human face’ on what the US’s ‘war on terror’ looks like on ground and in the eyes of children far away from this country. The cinematography uses mainline techno-spy thriller film devices to site and situate, black and white still shots with detailing information techno-type scrolled. Many of its landscape shots are beautiful. It is, in short, a very polished film, not polemical, just disturbing and questioning. 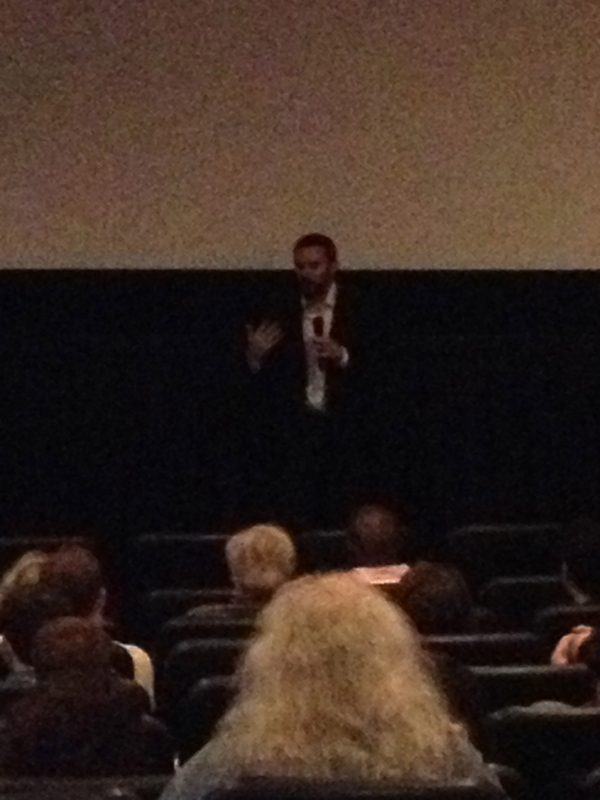 After the credits rolled, the film got a round of applause and then a more sustained one followed as Scahill came out and answered questions. 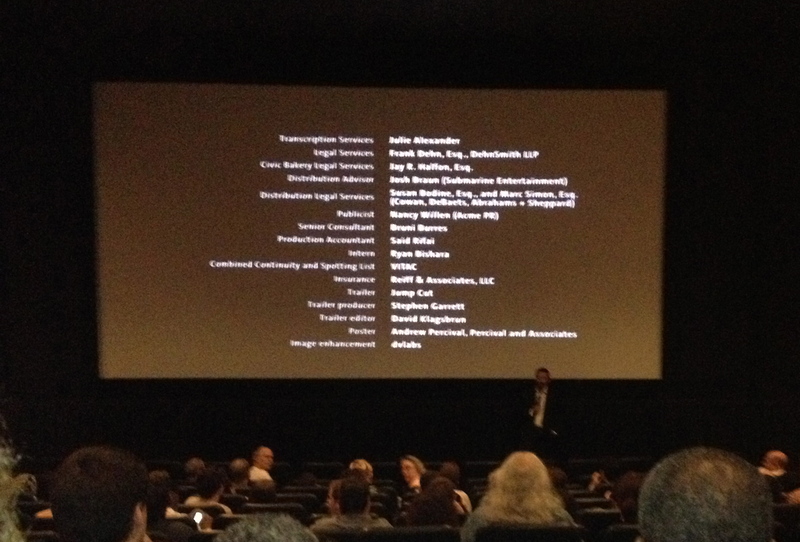 The first comment, a sincerely moved audience member, cited a comparison to Hitler (which was not a good start). Another man from Nigeria wanted to give him information on what was happening in his country. I recorded some of 20 minutes of the 40 minute exchange, including a question I posed about his perspective on the continuities between the Bush administration and the Obama administration. For me, this is a key question as evocations of a shared ‘mentality’ or ‘the system’ are inadequate. In addressing it, he cited something I’ve heard him say before, namely that liberals have ‘checked in their conscience’ with Obama. He cited the case of Obama still using rendition through sub-contracting it to various groups in Africa, mentioning a flight from Kenya to Somalia and an underground prison. I believe its in the book but I haven’t got that far yet. But this leaves the larger question unanswered. How did an anti-dumb war, civil liberties championing constitutional law professor get so enveloped that he doubled down on certain modalities of the war on terror established by Bush? Was this a political anxiety (or ‘seize the flag from the right’ project) that Democrats should always appear ‘tough’ as well as ‘smart’ on national security? Was this a desire by this once outsider and subsequent product of the establishment to still demonstrate, to perpetually demonstrate to the permanent national security state, that he really was one of them, that he believed the same things? Was this a product of the seduction of the Washington power game, of the gravitational pull of the enormous mightier-than-one-president ‘top secret America’ post-9/11 state? Or was this the inevitable ‘growth’ of a leader as they transition from being a candidate assembling a winning coalition to a president charged with the weight of government? Part of winning is seducing some groups (civil liberties democrats) while marginalizing others (there’s a scene where a Pentagon reporter cites what is presumably one of his articles in The Nation and this prompt elicits a ‘conspiracy theory’ tag from the spokesperson)? I believe historians of his presidency will be debating these questions. Geographers, hopefully, will have rich books out on geographies of the war on terror out in the next few years (Derek Gregory’s Everywhere War is much anticipated). Scahill’s world is that of the investigative reporter. He’s focused on the facts, details and lines of connection that reveal abuse of power and extra-constitutional excess. Don’t expect to have Agamben cited. That is the power and value of his work. It gets under the skin of the conventional wisdom and general consensus on the war on terror. It disturbs. With the journalistic revelations of the last week (and there’s a lot more coming from what Scahill indicated; he also mentioned how journalists are now changing their digital behavior in big ways), the whole everywhere endless terror security surveillance state is cracking open before our eyes. Its not hiding in plain sight anymore. This entry was posted in Current affairs, Dirty Wars, drones, Jeremy Scahill, Obama, Somalia, war on terror, Washington D.C., Yemen. Bookmark the permalink. One should not underestimate the psychological pressure on policymakers. Who after all wants to be the individual who presided over a mass casualty attack? When an individual-really in any walk of life-takes on a responsibility to protect there is a strong incentive to err on the side of caution. What Obama has shown in his foreign policy is a desire to limit the size of commitments and policies that lead to escalation ladders he has no intention of climbing. Given the alternatives, his is probably the least militaristic foreign policy Americans can hope for. This is a good point. The film is useful in prodding us to debate these issues but it is not a comprehensive review of the competing demands on the president and those charged with security. Scahill and its director would argue, I believe, that how the war on terror has been waged by Obama is counter-productive and self-defeating. There are two interviews with an anonymous JSOC source in the film. In, I believe, the second he states that, and I’m paraphrasing, “we’ve created this elaborate and hugely expensive hammer and it keeping itself in power by going around the world looking for nails.” That is one argument: the national security state informatively creates that which it charges itself to eliminate. There is a second slightly different argument which is that over-use or inept use of violence produces more terrorists. The US ends up perpetuating that which it seeks to overcome. Rumsfeld famously asked in October 2003: “Are we capturing, killing or deterring and dissuading more terrorists every day than the madrassas and the radical clerics are recruiting, training and deploying against us?” The film makers ask: “Are we capturing and killing more people that do not threaten us every day than the small group of terrorists that do?” By doing this, the latter group grows. Now this is a debatable point as is the film’s suggestion that Al Awlaki could have been arrested. Its importance is in forcing us to ask that question and debate it openly.